Considering the quality of fish in Japan, it's surprising no-one thought of this before. 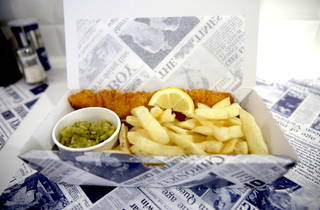 Malins is billing itself as the country's very first authentic fish and chips shop – and with a Scottish chef (who relocated to Tokyo especially for the launch), a British co-owner, and ingredients such as the batter and cooking oil shipped in especially from the UK, 'authentic' is no misnomer. We headed over to the Roppongi-based shop one lunchtime and squeezed onto counter seats in-between groups of chatty British businessmen. There's space for about eight people inside the shop, which is light and bright, and offers you a view of the 'master fryer' chef at work. As we waited to be served, one of our fellow customers confirmed that his meal was, in fact, 'better than what you get back home'. The secret, says Japanese co-owner Ryuhei Takizawa, is bringing together the best of both worlds. 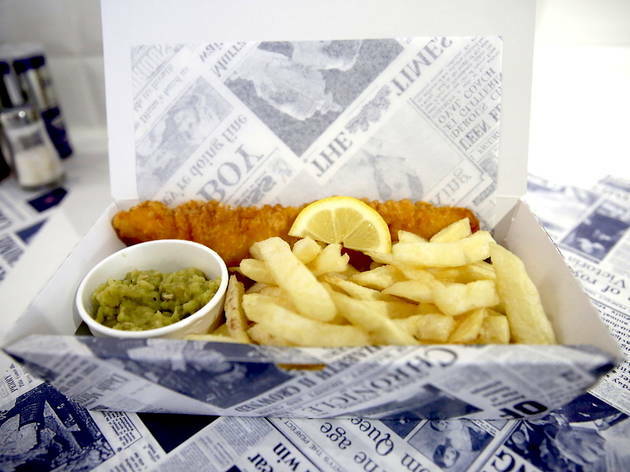 Fresh cod from Japan is delivered each day before being fried in their secret batter mix, and then served with fries and mushy peas. The result is a deliciously rich and crispy comfort lunch – or late-night snack. A regular set is ¥1,300 while a large set is ¥1,500. Don't forget to add vinegar.